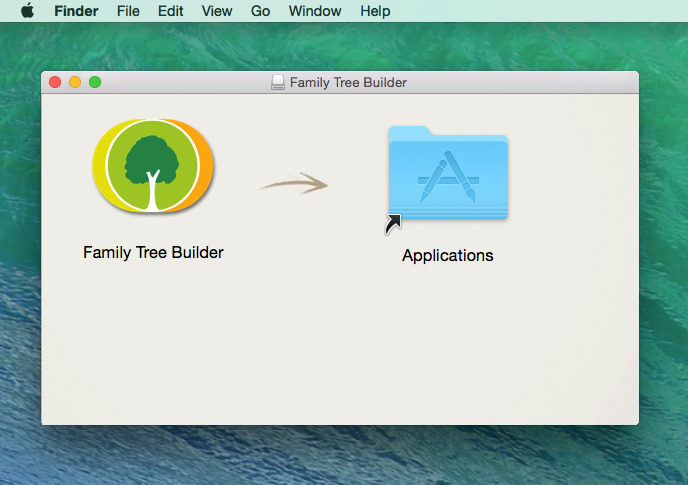 Family Tree Builder 7.0 now available for Mac! We’re happy to announce that Mac users can now download and use MyHeritage Family Tree Builder! Like the Windows version, it’s completely free! There have been frequent requests by our users to run Family Tree Builder 7.0 on the Mac operating system. Many of our users have switched in recent years from Windows to Mac and wanted to continue using Family Tree Builder, their favorite genealogy software. We are in the advanced stages of developing a native Mac version of the software, with the look and feel that Mac users will appreciate. Meanwhile, until the new native version is ready, we have also created a version of Family Tree Builder for Mac called Family Tree Builder Mac Extension, that looks the same as our Windows version, and does not require Windows or any additional setup or configuration when downloaded. Drag the Family Tree Builder icon to save it to your Mac computer. Once installed, the software will run directly on Mac computers. The minimum OS version supported is OS X. It uses a system for porting Windows software to Mac called CrossOver by CodeWeavers. Family Tree Builder’s main features run the same in Family Tree Builder Mac Extension, including Sync with MyHeritage, Smart Matches™, Record Matches, the consistency checker, charts, etc. However, there are several minor features not compatible with the Mac OS X that will be unavailable for Mac users. These are: maps, formatting in notes (e.g. bold, italics, etc. ), book reports (though they can be created online), and display of right-to-left languages. Everything else works the same as on Windows and the file formats are the same so you can transport Family Tree Builder projects between Windows and Mac. Have more questions about Family Tree Builder Mac Extension? Read our detailed FAQ. Very pleased to see Family Tree Builder 7 for MacOS X! I primarily used Mac computers (as I have a music studio equipped with Macs), but have been hanging on to an old Windows Vista Business machine for the sole purpose of running FTB7. Kudos. Echo your comments Craig! I have also been holding on to an old Vista PC just for my family tree. Moved everything immediately to my Mac. Much better! the extension or the other? You can install the extension direct from http://www.myheritage.com/ftb. We hope to come out with a native MAC version soon. Great news indeed!! Will be waiting for the native-Mac FTB too! !